Top Care tips on how to clean your door mat - The Turtle Mat Blog - For news, features and competitions! The Turtle Mat Blog – For news, features and competitions! Nicole Loy on the subject of Blog of the Month,Household advice,In the Home. Posted on November 12th, 2018. Your door mat is the first impression of your home you give to guests, so it’s important that your mat is looking its best. Turtle Mats are tried, tested and trusted to trap 95% more dirt, dust and moisture from entering your home, keeping your floors consistently spotless. It couldn’t be easier to keep your Turtle Mat’s clean too. With nearly 25 years of experience selling and designing door mats, we have put together a list of our quick and easy care tips for your door mats and runners. There are many key benefits to cleaning your door mat; such as improving absorbency, keeping your mat hygienic and maintaining its quality appearance. For the best performing door mats you need to look for ones with a high absorbency level and strong dirt-trapping abilities. Our mats and runners are made from super absorbent cotton tufts and a microfiber blend. They are designed to work together to trap dirt and absorb moisture, giving your floors the protection it needs from the wet and mud of the great outdoors. All our mats are guaranteed for five years so you can be assured that there is no better door mat or runner to protect your home. It is essential to check if your door mat is suitable for machine washing or whether you will have to wash by hand. All our Turtle Mats including runners, can be machine washed at 40 degrees making it easier to clean and a lot less time consuming. We know from experience that it is beneficial to use a non-bio, colour-kind detergent as this will help to maintain the absorbency of the mat and preserve the colour. Avoid adding fabric conditioner or using washing liquids/capsules/powder with added conditioner at all costs! Top tip: Turtle Mats love being machine washed, in fact they get better and better with each wash as it raises the pile and maximizes its absorbency. The best way to dry your mats are to either leave them to dry naturally or put them in the tumble dryer on a low heat setting. This is a recommendation for Turtle Mats only, so if you have a different brand of door mat, please read the manufacturer’s instructions to see if your mat is suitable for Tumble drying. A great way to keep your mat cleaner for longer is to hoover your mats regularly, not only will this help to raise the pile but it will also help to improve absorbency of your cotton mats. Or you can simply shake your mat outside to remove excess dirt. Top tip: Never place your mat on a damp floor and for best results, lift and launder your mats regularly. How often should I clean my mat? Ideally we would recommend hoovering your indoor mat weekly and washing your mat monthly, although this does really depend on how dirty your mat gets, so trust your judgement on when you think it needs a wash. Outdoor mats are easy to clean too! When the weather turns and it’s really wet and muddy outside, an outdoor mat can help you scrap off the worst of mud before you step inside. We’ve developed a range of outdoor mats that are highly durable to brave the seasons and defend your doorstep for years to come. Heavyweight and long-lasting, Mud Hog has a springy recycled rubber-grain backing, that allows rainwater to simply drain away, it is so easy to clean with either a quick shake or a hose down. 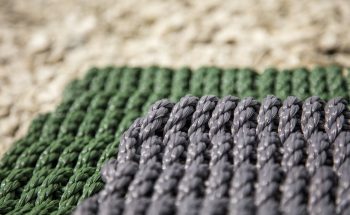 Cape Cod are a range of all-weathered, mildew resistant outdoor mats built to withstand the elements. 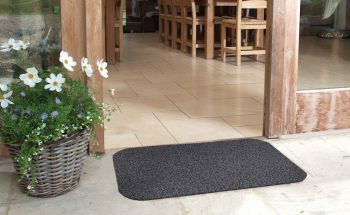 The ridges of these woven mats are perfect for scraping off dirt at the door and cleaning the mat couldn’t be more simple, all it needs is a hose down and a stiff brush to remove any stubborn pieces of dried mud.